Mureş (engl. Mures) is situated in central part of România. In Hattrick this region has the ID 1524. 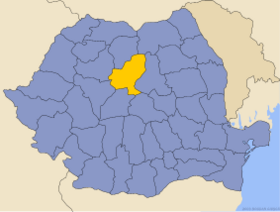 Mureş is the 17th popular Romanian region with a 1.9% from all romanian users. This region wasn't from the very beginning of the Romanian Hattrick league so the oldest managers from Mureş played in some other regions before. Chimica Târnăveni won Divizia A in season 29. This page was last edited on 17 August 2012, at 14:46.